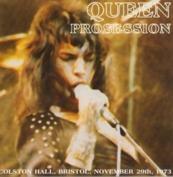 Recorded: Colston Hall, Bristol England, November 29th. 1973. Sound: Good/very good audience recording. Comments: Nice cd with an early concert. Some rare tracks on it. I have only come across one tape source of this concert, as long as I have collected. Well, there are 2 'versions' around, but one sounds like a '4th. generation' copy. 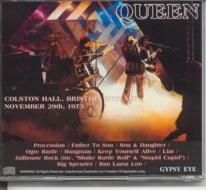 'Gypsy Eye' label has used the lowest generation on this bootleg cd. Which make this bootleg well worth to search for. As far as I know, this is a complete concert..
Queen’s first organized tour lasted for five weeks, starting on November 12th 1973 in Leeds, in support of Mott The Hoople. Hoople were experiencing some popularity with their David Bowie penned hit “All The Young Dudes” and Queen’s strategy to dovetail onto the same glam rock audience just about paid off. The reviews were mixed and the existing aural documents, while do show them gaining in confidence and winning over the audience, also reveal a fair amount of scepticism. “We’re called Queen…we’d like to carry on with a number called ‘Son & Daughter’.” Freddie doesn’t sound as nervous as he did in Birmingham two nights before, and May is confident enough to push the guitar solo a bit further. “Ogre Battle” has a very strange and subdued sounding guitar break in the middle. May must have been in a quiet and lyrical mood that night because all of this soloing tends to be on the quiet side. “Hangman” serves as a slow, ponderous rocker in the middle of the set and an early tour-de-force, the source for dramatic contrasts. During the fast latter half other song Freddie gets into some ”you can come along…” pleas from “Ogre Battle” with May and the rest of the band playing along. “Jailhouse Rock,” which pleases a female fan by the tape recorder, references “Stupid Cupid” and Shake Rattle & Roll” but without going into “Be Bop A Lula.” The final song of the set is “Bama Lama Bama Loo” with references to “Tutti Frutti,” Freddie doing his best Little Richard interpretation. Overall Procession is a strong release and the only silver edition of this tape. With so few tapes from Queen’s tour in circulation and with fewer pressed, this is a great Queen title to have and one of the essential ones for the collection.